Named after the Smokey Mountains of Tennessee, famed for it's tradition of barbecuing, the Weber® Smokey Mountain Cooker™ 47cm is the perfect place to start exploring the world of low and slow cooking - where taste is far more important than haste - so reduce the heat, lengthen the cooking times and enjoy the flavour. The Weber® Smokey Mountain Cooker™s have a loyal following in the barbecuing community, even inspiring their own fan based website, as they are the perfect barbecue option for anyone who wants to take their time to slow down cooking to maximise a full on deep, smoky taste and still have the option for charcoal grilling when it speed is more important though the Smokey Mountain Cooker™ will compliment a gas or charcoal barbecue rather than replace it. The Weber® Smokey Mountain Cooker™ 47cm takes the famous classic Weber® kettle barbecue design stretching it out to create the distinctive bullet shape creating more space so smoke can circulate infusing exciting flavours into food during cooking and enhancing the deep smokey barbecue taste. The Weber® Smokey Mountain Cooker™ 47cm is no different from Weber®'s other charcoal barbecues in that it uses the same tried and tested, dependently durable construction techniques, such as the porcelain-enamelled lid and bowl common to all Weber® charcoal barbecues, to take all the bashes and crashes of it's long life. The porcelain enamelled lid has a glass re-inforced nylon handle close to which sits the lid mounted thermometer to monitor the temperature levels inside the Weber® Smokey Mountain Cooker™ 47cm during cooking. At the other side of the handle sits a rust proof aluminium vent allowing the control of the airflow through the Smokey Mountain Cooker™ to help regulate temperature when used in conjunction with the rust proof aluminium vent in the bowl at the base. On the side of the “bullet” there is a lift off weather-roof aluminium door, for easy access into the smoker, close to which is located a silicone cap to allow for the use of thermometer probes to check the temperature within foods being cooked on the uppermost of the two triple-coated cooking grates, with their combined 3103cm cooking area, inside the Smokey Mountain Cooker™. In the base of the Weber® Smokey Mountain Cooker™ 47cm sits one of the key elements in the smoking process, a water bowl, from which steam is produced carrying flavours and moisture throughout the smoker during cooking infusing food with flavour and keeping it moist. Add wood chunks or chips in pecan, cherry, mesquite and more for an even greater range of taste experiences. Below the base there is an aluminium heat deflector, located between the three legs, which helps maintain the temperatures inside the smoker along with reducing the likelihood of burning or scorching to the surface on which the Weber® Smokey Mountain Cooker™ 47cm is stood. To help ensure the best results are achieved from the Weber® Smokey Mountain Cooker™ 47cm Weber produce an extensive variety of accessories to help widen the smoking experience with well designed and simple to use items from basics such as charcoal briquettes, utensils, and cleaning brushes to smoke enhancing wood chips and chunks in apple, cherry, hickory, mesquite, whisky and beech woods not forgetting useful racks and baskets for putting food in,or on, in the smoker or Bear Claws for shredding pork. Use the distinctive "Weber® Bullet" to expand your barbecuing horizons adding extra depth of flavour. 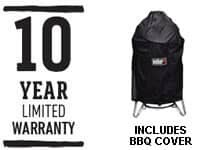 There are currently no reviews for this product Click here to add your review to be the first to review the Weber® Smokey Mountain Cooker™ 47cm Black BBQ.